The Fastest Growing Airlines are in the Middle East - Plunkett Research, Ltd.
Emirates Airline, based in Dubai, UAE, has doubled its sales over the past five years, hitting about $20 billion in 2013. This makes Emirates, a relatively new company, about one-half the size of United Airlines, but United’s growth has been fueled recently by the acquisition of Continental, not by the aggressive expansion practiced by these Middle Eastern firms. This stunning growth, which is stealing market share from the other long-haul, international airlines, is the result of carefully orchestrated, massive investment over a relatively short period of time. Emirates’ reach now extends to 132 cities in 77 nations on six continents. Competitor Etihad Airways, also based in the UAE and already at $5 billion in revenues, has similar expansion goals. What’s going on here? How did a nation of only 170,000 citizens become a world power in airlines? In a bold and ambitious gamble, backed with billions of dollars, the government of Dubai took advantage of the fact that jet airlines based in Dubai can reach two thirds of the world’s population in eight hours of flight time or less. If you look at a world map, it’s easy to see that the UAE makes a perfect hub for linking passengers from Europe to Africa, India and the rest of the Asia-Pacific region—the parts of the world that are growing fastest in terms of air passenger travel and air freight. At the beginning of this century, Dubai ranked low on the list of the world’s busiest airports. In 2014, Dubai edged out London Heathrow and Hong Kong to be the world’s leading airport by international passenger count. (Atlanta’s airport is still the largest in combined domestic and international passenger count, at 95 million per year.) By 2019, the Dubai airport is expected to reach 100 million international passengers yearly. Around 2025, a second and even larger airport will open in Dubai at an investment of $80 billion, with the ability to serve 120 million passengers per year. 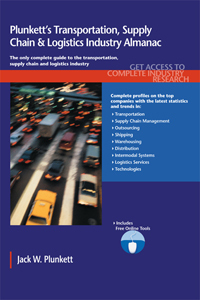 Our new Plunkett’s Transportation, Supply Chain & Logistics Industry Almanac 2014 is your key understanding to this growing industry.